One popular argument for avoiding meat is the premise that cows emit methane in their burps and farts and for this reason are contributing to global warming. The original version of representative Alexandria Ocasio-Cortez’s “Green New Deal” resolution calls for “a world War II-style mobilization effort to eliminate greenhouse gas emissions from agricultural operations. . . We set a goal to get to net-zero, rather than zero emissions, in ten years because we aren’t sure that we’ll be able to fully get rid of farting cows and airplanes that fast.” (Ocasio-Cortez staffers have since removed the word “farting” from the fact-sheet.) With rubbish like this coming from Congress, can vegetarianism by fiat (and a ban on airplane travel) be far behind? Methane has the chemical formula CH4 (one atom of carbon and four atoms of hydrogen). Methane is the main component of natural gas; it is also created by certain types of bacteria that break down plant matter—whether inside or outside of a cow. 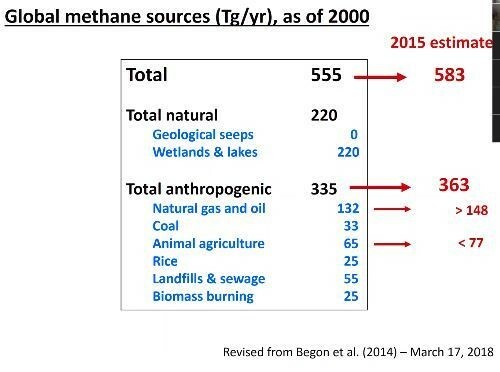 Here’s a graph showing sources of atmospheric methane. As you can see, animal agriculture (including pigs, chickens and cows) contributes at most 13 percent, assuming that all these theories are correct. Since cows break down vegetable matter in their rumens, the methane created escapes out of one end or the other. Cows are a convenient target for meddling bureaucrats since no one dare propose filling in wetlands or forbidding rice production (or cutting down rain forests or getting rid of termites, which are other significant sources of methane). According to lots of highly trained scientists, the Earth’s atmospheric methane concentration has increased by about 150 percent since 1750, and it accounts for 20 percent of the total “radiative forcing” from all of the long-lived and globally mixed greenhouse gases. The other main two greenhouse cases are nitric oxide (N2O) and carbon dioxide (CO2). Methane actually breaks down much more quickly than the other two. 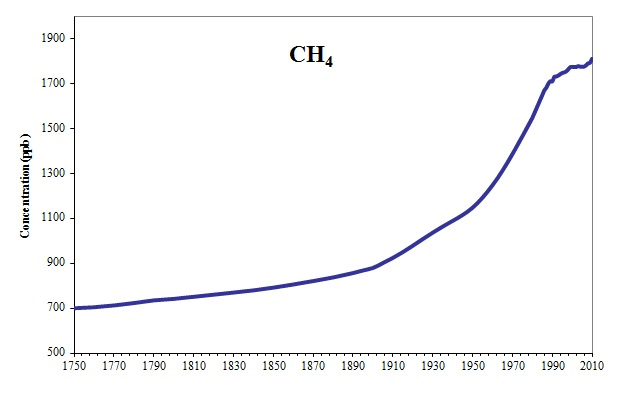 According to climate scientists, this increase in methane is a main cause of global warming and who am I to argue? However, I do have just one question. 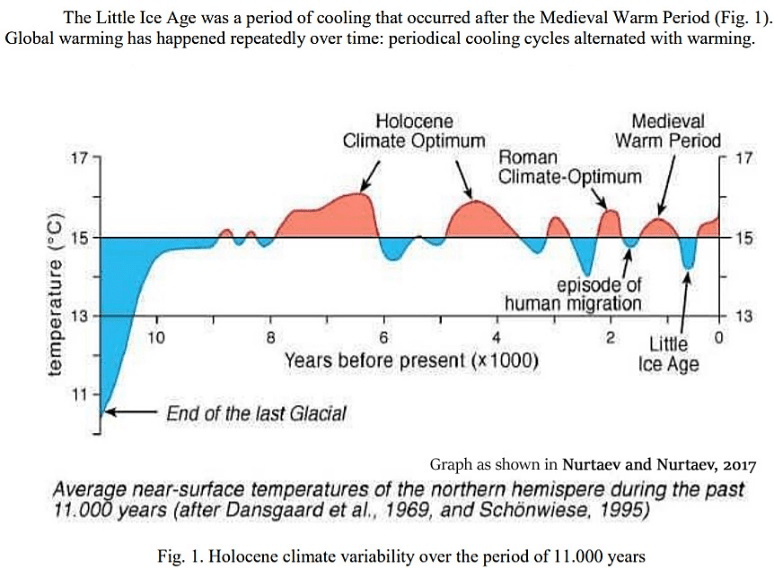 If the increase in methane is causing global warming, how come this graph (flat until recent times, and presumably flat pre-1750) has no relation to the actual temperature trends over the last several hundred years, including the Medieval Warm Period and the Little Ice Age? But leaving this inconvenient fact aside, let’s focus on the cows. 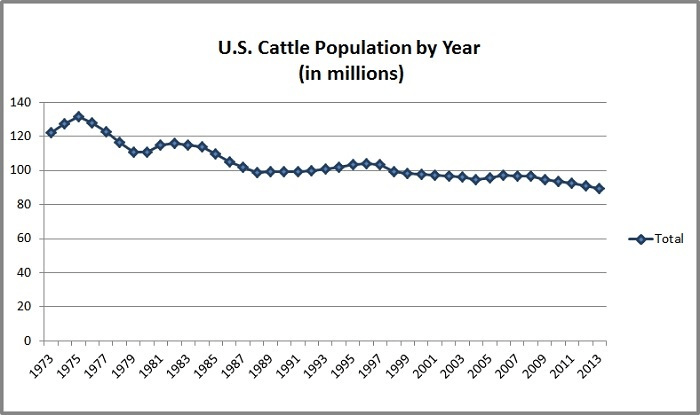 There are approximately ninety million cows in the U.S. today, down from a high of about one hundred forty million in 1974. Worldwide the number of cows has remained stable over the last seven years, yet methane is still increasing. Hmmm. . . another inconvenient fact. There are a lot of good Internet discussions about what is causing the rapid increase in methane during the last few decades; one culprit may be shale gas production. But for sure it’s not cows. So you can enjoy your hamburger—preferably a grass-fed burger—without any qualms about destroying the planet. Why is grass-fed better in terms of climate change arguments? Because well-nourished pasture is a big sink for carbon, thus reducing the really long-lived so-called greenhouse gas. However, the global warming folks are not likely to give in to rational discussion any time soon, and it’s easy to see the handwriting on the wall. Governments will encourage confinement systems of dairy and beef production so the methane can be captured and turned into natural gas. There will be lots of grants and other incentives to the corporate farms to help them do this. But the cows raised outdoors will remain targets since it’s harder for the small farmer to fight back. Look for proposals to tax grass-fed cows coming soon. The Weston A. Price Foundation advocates a mixed diet that includes pasture-raised animal products like beef, pork, raw milk, cheese, eggs and poultry. Become a member and support the work we do. 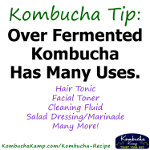 Thank you for contributing to a more logical perspective! There’s an additional perspective (on what some refer to as “climate change”) that presents very interesting cosmological changes throughout the rest of our solar system, inclusive of the earth – all in relation to the sun as the main driver for climate. I like to include that as well! Especially since the sun has its cycles that directly impact on earth! A greater all-inclusive picture is now being formed as to how our climate is co-created. The more that picture becomes known the more the pronouncements of “the global warming folks” will simply evaporate under the more radiant and brighter light of truth! I see the urgent need for supporting “the small farmer”. The need has been apparent to me for well over the past decade since the raw milk raids under color of law with overwhelming deadly force. When our local community lost a small farm in 2011 that motivated me to enroll as a student of the Organic Laws as taught by Lawyer-professor Ed Rivera who founded the “Organic Laws Institute.” I understand how it is possible to say “it’s harder for the small farmer to fight back.” This is much like “David and Goliath.” I think we would agree that today’s “Goliath”/giant/s are the most-dominant food & chemical-ag corporations. Then there is another giant known as “government.” It will be a truly glorious day when “the small farmer” essentially re-discovers the Organic Laws and understands what each of these four most-foundational Laws say about every American’s Lawful relationship to government – especially concerning the Lawful limits to government regarding what government can tax! The only way that “the small farmer” can pay a grass-fed cow tax is essentially by voluntarily donating a self-assesed contribution – unless the farmer is milking government cows on government property. The Organic Laws positively show how this is so. Its about time that America came back home by returning to the real Law! There is no logic behind the climate claims of those pushing the vegetarian agenda, which by the way, is very lucrative. 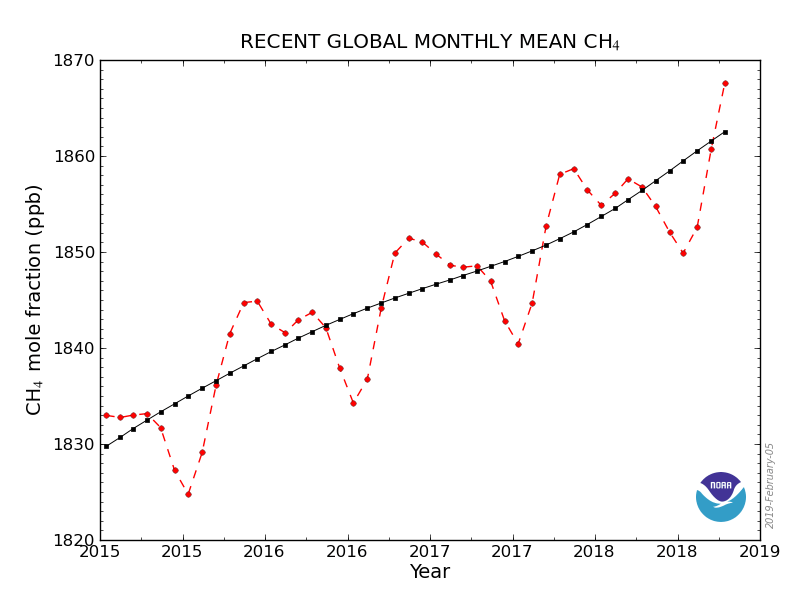 Methane is indeed increasing; it is one of the unstoppable feedback mechanisms driving global warming exponentially higher. The climate warms, the permafrost thaws, methane is released, the climate warms, more permafrost melts, the climate warms even more and on and on. And people continue to buy, whatever is being sold. One grass-fed cow requires much less energy then acres of soybeans or lentils which have to be grown in fields requiring fertlization, pest control, cultivation etc. Forget the third world small farmers sustainable practices , all the vegetarian manufactured meat alternatives are sourced from plants grown by corporate farms.. Connect the dots. Educate yourself. Reacquaint yourself with reality.